This past week we finally got Nintendo’s Switch online service. And… it’s not bad, we suppose, but we don’t see too much of a difference aside from having to now pay to play online with friends. At the very least, it’s cheaper than both Xbox and Playstation for their online services. The NES games that come along with the online service aren’t too bad, but we also have the mini NES Classic console. Many of the games are the same. We understand that more games will be added regularly — indeed, the titles for the next couple of months are available on the website that gives the information — and that the games have newer online compatibility. We did test it out with our good friend Jett at In Third Person, playing a bit of Dr. Mario and River City Ransom (where I may have… accidentally killed him). That was tons of fun and we’re looking forward to playing again, both with Jett and with others! All in all, it’s not a bad service, not for the cheaper price that we’re paying and for getting the chance to play some old games with friends. We’re looking forward to see what kind of updates the service will get in the coming months, perhaps games from other Nintendo eras like the SNES and maybe the N64. Do you have the Switch Online service? What do you think of it? The Nintendo Switch had a lot of pressure put on it, considering how poorly in sales the Wii U did. The Switch itself is going strong, partly due to all of the games — both first-party and third-party — that are scheduled to appear on the console, something that the Wii U did not have. Yet, a handful of the Switch’s best selling games are Wii U ports. I think the Switch is mainly what the Wii U didn’t–and couldn’t–do. For example, they put so much hype into the gamepad so you could play the game “on the go.” Yet, it only lasts about three feet. Now we have the Switch, where you can literally take it anywhere. And not only that but play it anywhere with friends or yourself as a handheld. The Switch definitely has the portability that the Wii U failed with. With the ported Wii U games, Nintendo does seem to be hyping up the Switch to be the better Wii U. Along with the updated version of Mario Kart 8 on the Switch and Pokken Tournament coming to the console in a couple of months, the Switch has games promised throughout the rest of the year and beyond, a far cry from the scheduled list of games that the Wii U had gotten. When the Switch was announced, we wanted to play through a few of our Wii U games because we knew we would be focusing on the Switch. When we went through our games, we realized that we really didn’t have a lot of Wii U games. Yet, we use our Wii U all the time. However, at this point, we mostly use it for Netflix and YouTube. Yes, YouTube seems to be the Wii U’s greatest workout, haha! 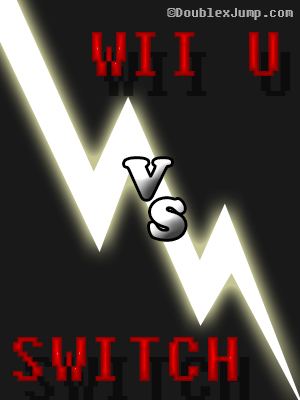 Honestly, we’ve even used the original Wii’s Virtual Console more than the Wii U. We still have a few Wii U games that we haven’t tried just yet, due to us being focused on the Switch. Still, the Wii U had some great games, and I’m curious as to what else Nintendo may port over to the Switch. I’d be surprised if there were no plans to bring over the Super Smash Bros. franchise onto the new console. Yes, we still have quite a few Wii U games to play through. But the bottom line is, Kris, which console is your favorite? I’m quite enjoying the Switch, but it could also be because it’s still new and shiny for us. I’m loving Breath of the Wild and the extra content of Mario Kart 8, and the Joy-Con are fun, easy to use controllers for the games. The major downside of the console, however, is the price. Not just for the main console itself, which wasn’t too bad, but for all the accessories. What about you? As of right now, I’d have to say the Switch. Mainly for the same reasons you just said. But, while the Wii U got a lot of backlash and I know a lot of people aren’t a fan of it, I absolutely love the Wii U. Not just because of Netflix and YouTube, but I found the overall console to be great and they had a lot of good games for it as well. It reminded me of the 3DS, which I love. Even with the Switch, I’m sure we’ll be playing our Wii U for a long time to come. Which console do you think is better? Let us know in the comments below! Summer is right around the corner (I think… it’s been very rainy over here lately), and with that is usually more time to spend playing video games. With the Switch, it’s easy enough to play outside too! I recently read an article about a YouTube channel whose whole premise is to take expensive gadgets and tech toys and drop them from enormous heights. It’s both exhilarating and frightening for a tech geek like myself. One of the latest videos tested the durability of the Nintendo Switch. Considering how difficult it was to get the console when it first came out, it baffles the mind to think that someone out there has an extra console (and the money) to test this out. Amazing, isn’t it? R.I.P. the poor left Joy-Con, but other than that piece, everything still seems to be in tact. So, if a Nintendo Switch can survive a 1000 foot drop onto concrete, then accidentally dropping it onto the kitchen floor shouldn’t be bad, right? Would you be willing to test drop some of your favorite gadgets? Know anyone crazy enough who would? What do you think of the Switch’s durability? I get so annoyed at this item. No warnings, lose your items, always spinning out… Although the tiny versions of your kart going zoom and the squeakier character voices are definitely amusing! I admit that the challenge of not being able to see with the Blooper clouding up your screen with ink is an interesting idea, I feel as if it falls flat. Half of the time, the ink doesn’t hinder your sight enough and it’s just more annoying than a challenge. While the Fire Flower is fairly creative when it comes to being added to the Mario Kart games, it’s not my favorite item. I feel as if it’s only useful if an opponent is right in front of you. Otherwise, I just fire them all off as soon as possible to free up an item slot. These things are all over the tracks… Why waste an item slot with them? Even if they omitted them and all the players in the first couple of places in the race got banana peels instead, at least that would be another challenge and amusing to see everyone slipping everywhere. What do you think of the Mario Kart items? Any favorites or least favorites?